We’ve compiled the results from the third annual #LibraryLovers campaign. What’s the #1 thing residents’ love about their libraries? The librarians! Nearly every one of the 3,000 valentines that were submitted this year mentioned how much librarians and are valued. They literally used the following words: “LOVE our librarians, “helpful”, “patient,” “friendly,” “knowledgeable,” and “not shushers.” They mentioned librarians by name and really liked that the librarians knew them by name, too. 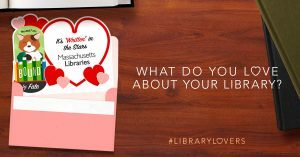 The valentines represent what we often say to legislators about why libraries are important; but there’s a difference between our saying it and hearing directly from residents who are impacted. It’s simply more powerful. In the 3 years that we’ve done the #LibraryLovers campaign, the MBLC has given legislators nearly 15,000 valentines because, as one resident said, we “can’t imagine a community without a library” either. I can't imagine a community without a library. …i also like it cause of there free wifi. If i have no connection at home i could just go to the library so i dont have to stay after school. -… they always have activities.I did one of the activities and it was awesome I made new friends and I learned new stuff. For a small community, our library has a very large footprint. Thank you. -[from a teenager] I love my library because I feel at home there. Not everyone can afford books off the shelf and the library helps give the community an equal opportunity to information and knowledge. Several of our librarians have become our friends, having seen my children and their love of reading grow over the years. Thank you for everything! I would be lost without this library. Between the staff and the books  this is such a gift! … I also enjoy spending time in a completely commercial free community space. For us, the library is essential for our success as homeschoolers. Libraries deserve top funding for providing education and culture, museum passes, advice, friendship, services, and so much more to the town. -I love the feeling of belonging I get walking through the doors. It's my sons favorite place. Librarians have always spoken directly to him [my son], even when he was four, and that made him feel valued. -I am proud of our town library and know that I will enjoy utilizing it for the rest of my life. If you ever want peace to do homework the library is for you. THE answer center for questions about everything and anything; taxes to truffles. I am so glad I live in a town with such a good library. We cannot afford cable and the number of DVDs that are available through inter-library loan in phenomenal!! The cookbook bookclubs give me the opportunity to meet and enjoy other members of my community that I otherwise would not have the opportunity to do so. Getting essentially any book in the world through inter-library loan! The library is a community center where I can go to educational meetings about local issues, historical events or world affairs. I remember one time i got to read to a dog and that was the best day ever. this library means every thing to me please save it. No member of society, from the youngest to the oldest, is neglected there; libraries contain treasures for all. As a senior citizen, nahant Library is a HAVEN of happiness, intellectual growth , and exploration. My life would be greatly impoverished without my library visits and the excellent help and guidance I get there. -My library opens a window to that world which would be shut to me without it. [My kids are] always begging to read books and to go to the library and I attribute their love of books to the library's engaging programs. Basically----I love my Library and am extremely satisfied. I even like that they have a bin in the lobby to drop off cat & dog food and I am now trying to make a small donation of food every week/every other week. I figure if I can check out books for free then I can make a donation that goes to a great cause! Made me feel welcome the second I walked in and answered every question I asked them. The laws that establish the authority and role of library trustees can be found in the Massachusetts General Laws Chapter 78. It is important to know that in some instances, state laws governing Libraries and trustees are superseded by local laws found in town and city charters. Trustees should be aware of all established and proposed local laws that pertain to the organization and management of their library. Today’s Trustee Handbook Focus looks at local charters and how they impact libraries. Some Massachusetts municipalities are governed by special legislation or a charter, components of which may or may not relate directly to the library. It is critical for trustees to know if their municipality has such a charter or has plans to implement one, and if so, how its provisions affect their library. While trustees have traditionally looked to Massachusetts General Laws Chapter 78 to delineate the rights and responsibilities of trustees to exert “custody and management” over public libraries, a local charter will take precedence over Massachusetts General Laws. Who will the director report to? In some towns, the town administrator has the authority to appoint department heads. Make sure that the power of the library board is not eroded; in other words, make sure it is spelled out in the charter that the board of trustees governs the library and appoints the director. Will the library be grouped with other town departments for purposes of efficiency? The library could lose its status as a separate department, becoming combined with other departments which do not share common missions or organizational/operational methods. Will all human resource functions be centralized? Under whose control? Trustees should help develop a municipal plan for the transfer of employees between departments. Make sure the library director has responsibility for the hiring, dismissal, and supervision of library personnel. Any charter proposal should contain provisions specifying the duties and powers of the board of trustees. Make sure the board has control of the library’s budget, personnel issues, and policy making authority. Another issue that might be introduced is the number and kind of trustees. Monitor for proposals that would change the way trustees are elected or appointed. Who has the authority to appoint trustees? Will there be ex-officio trustees (those appointed by virtue of their office, i.e. selectmen and clergy) who may change the constitution of the library board? If your municipality is considering a charter or home rule change, it is imperative for your board to be involved and aware of the seriousness of the issues at stake. If charter reform, home rule petition or other effort is underway to revamp municipal power and decision-making, the library should get involved from the start to advocate for wording which exempts the library from being under the control of another municipal department or officer. Successful boards of trustees know what’s happening in their communities and are active players in the local political process. Remember that it is your responsibility as a trustee to advocate for the best possible library services and practices. Library boards that stay active and involved in community affairs yearround are better positioned to make their case for the library than boards that wait until “crunch time” to get involved. Today’s Trustee Handbook Focus can be found on pages 39 – 41 of the Massachusetts Public Library Trustee Handbook. 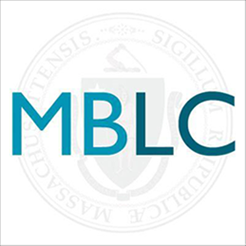 For more information about all services and resources available to trustees please visit the MBLC Trustee page (https://mblc.state.ma.us/for/trustees.php). As MBLC staff member Rachel Masse said throughout the PJ Drive, “These libraries are killing it!” No truer words were ever spoken! 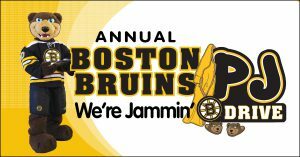 Not only did libraries hit their goal of 10,000 PJs, libraries beat the goal for the entire drive (all organizations from the entire state) of 12,000! Libraries collected 13,022 A new record of 138 registered for the drive–thank you to all the libraries that participated—even if your library collected 2 pairs, they make a huge difference to the kids who receive them. Champion by 45 pairs: MLS; MBLC will deliver the PJ cup to MLS filled with chocolate. Posted on March 21, 2019 April 1, 2019 Author Matt PerryCategories PJ DriveLeave a comment on The 2019 PJ Drive was a Record Smashing Success!